It was said of one man that his stomach gradually expanded on a daily basis, and if he ate and drank a lot he felt even more hungry and thirsty. His face was pallid and unpleasant to look at and he was in terrible pain, day and night. While he was in this terrible state, he went to the relics of the saint, weeping fervent tears and begging to be given a cure and not to leave empty-handed. Since the grave was well-sealed and never opened, the by-standers laid him lengthwise, on his back, on the grave, placed the icon-light on his stomach and rubbed oil from it onto him. The man fell asleep for a short time, during which the wild beast inside his belly was, in some strange way, cut into two. He awoke and felt the need to evacuate his bowels. When he did so, he found two pieces of a snake, each one half as big again as a span. The priest said that a lot of people saw this and were amazed at this strange, wonderful, new and recent miracle. 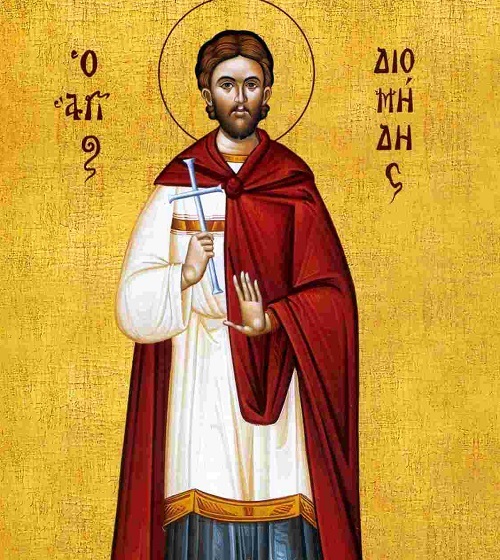 The man himself regained his colour, was no longer sick but very healthy, with a handsome face, and he glorified the Lord and Saint Diomidis. There was a woman who had a crab in her stomach, from which she suffered greatly, day and night. When she heard about and saw the cure that the other man had undergone [the snake being expelled in two pieces] she also went to the saint with great desire and fervent faith. She touched the tomb containing the mortal remains and rubbed it with her stomach, because she was in great pain, begging the saint to free her from the illness. She then took the icon-lamp that was on the grave and drank some of the oil, rubbing her painful stomach with some more. Then the thing that was inside her was squeezed and tried to come out. The woman was terrified and, opening her mouth, vomited up the crab in front of everyone. The women was released from this terrible affliction and praised God and His servant Diomidis. She didn’t quite regain all her strength, however, but, until the end, was unable to endure much for very long. The saint did this through his dispensation, so that she would be troubled bodily, but be renewed inwardly.